Stevens in his internship office. Photo courtesy of J. Stevens. At NC State University, a 10-week internship is required of all the undergraduate students in the Department of Parks, Recreation, and Tourism Management. Despite the requirement, some PRTM students excel in maximizing the opportunity before them. We talked with Jesse Stevens, a rising senior in PRTM, about his experience with Ride the Wind. 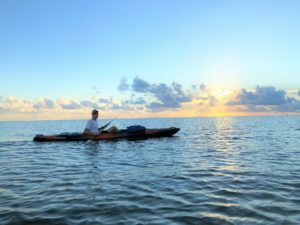 Recognizing the importance of local culture, Stevens developed a kayak tour that connects tourists to the community and the features of the natural environment that support it. Q: Tell us about your experience, i.e., your internship position, duties, the company, etc. A: I spent this past summer interning at Ride the Wind, an outfitter located on Ocracoke Island in the North Carolina Outer Banks. Ride the Wind seeks to provide its customers with exceptional outdoor recreational activities. These opportunities include surfing, kayaking, and stand-up paddle boarding. As an intern, I had many duties, but my primary duty was serving as a kayak guide. As a kayak guide, I led groups of people around the island while informing them on Ocracoke’s history and ecology. My favorite tours were the ones where we encountered wildlife like stingrays, pelicans, and dolphins. 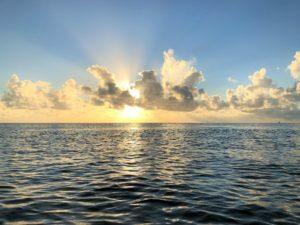 As an intern, I also learned the logistics of running an outfitting business, particularly an outfitting business that is in close proximity to a National Seashore (Cape Hatteras). Q: What did you expect entering this position? What surprised you? A: Entering this position, I had some expectations on what it was going to be like living in a community that relies on tourism to survive. I expected the island to get really busy and full of people. This expectation was exceeded on the week of Fourth of July. I was amazed at the sheer number of people that were on the island. I never imagined the village could house that many tourists. That’s when it hit me that tourism was the driving force for the economy on the island. I was also surprised to learn about the different relations that locals had with tourist and the National Park Service. It was always interesting to learn the local point of view about different decisions regarding things like regulations set by the National Park Service and tourism decisions like introducing a passenger ferry to the island. As a student, I felt that this learning expanded my views on the tourism industry as a whole. Q: How has an internship influenced your drive to enter the tourism field? A: This internship has definitely influenced me to enter the tourism field. I have learned so much about the industry as a whole and want to continue this learning through further experiences in tourism. It has shown me the importance of the tourism field and how it supports communities located in tourist destinations. Because of this, I hope to continue to work in communities where tourism is the center of the local economies and to foster this relationship. Q: Tell us about the new tour you designed. What encouraged you to create it and implement it? A: I developed a new kayak tour that explores the north end of Ocracoke Island. I wanted to create a tour that explored an area of the island that our other tours hadn’t already (all of the current tours are on the south end of the island). This new tour has a lot more emphasis on the ecology located on the island and the fishing culture. On this tour, guest spend time exploring creeks located in salt marshes and discovering the wildlife that lives in the underwater grass beds along the coast. Also, a part of this tour is a clamming experience. Guest learn how local fisherman bring home dinner by using clam rakes. I wanted this tour to have more of an emphasis on the ecology of the island, thus creating a better connection with the people and the natural resources found around them. I also want to add some sort of fishing component to create a better understanding with tourist and the locals’ way of life. Q: What key insight would you recommend to other similar tourism businesses? A: I would recommend to never have “tunnel-vision”. To be successful in this business you must consider the opinions of all of those who are involved (tourist, locals, government). Once you have a better understanding of the relationships that foster your business, then you can begin to create opportunities that meet the needs of everyone. Looking out onto Pamlico Sound on a kayak tour offered by Stevens. Photo courtesy of J. Stevens. • NC State Coastal Summer Tourism Survey Is Happening! • Herbicide Dose Calculations for Landscape "Islands"